North Carolina’s Bowman Gray Stadium has always been a breed apart. The Winston-Salem quarter-mile oval is known for intense, no-quarters racing, with pushing, shoving and occasional fisticuffs a regular part of the program. Track management has traditionally reacted to those outbreaks with a wink and a nudge, knowing full well that their particular brand of “extracurricular activity” plays a major role in filling the track’s 17,000 seats on a weekly basis. Saturday night, however, the track known as “The Madhouse” finally went a step too far. During the evening’s Stadium Stock feature, drivers Andy Spears and Blake Walker tangled, causing Walker to spin. All in all, it was a fairly nondescript incident; a regular part of the weekly landscape at virtually any short track across the country. During the ensuing caution period, Walker drove his car into the back of Spears and turned him around in retaliation. Again, nothing remarkable for fans raised on a weekly diet of drama and conflict at Bowman Gray Stadium. What happened next, however, went far beyond the pale. As Walker was assisted from his car by track safety workers and several off-duty Winston-Salem police officers -- who routinely provide security at the speedway -- Spears slammed into it once again, causing the unmanned machine to strike Walker. He then spun his car in repeated circles around Walker’s damaged racer, placing Walker, the officers and safety workers directly in his path. Officer C.K. Robertson then drew his gun and pointed it at Spears, who immediately stopped his car before being removed from the vehicle and escorted back to the pit area. Both the Winston-Salem Police and Bowman Gray Stadium say they are investigating the situation, with charges and sanctions against Spears possible. Officer Robertson is not under investigation. It is time for Bowman Gray Stadium to draw a line in the sand and rein-in the “Madhouse” mentality, before it finally goes too far. Conflict, drama and fisticuffs have characterized the speedway’s weekly racing program for decades, and while fines and suspensions are not unprecedented, competitors know that their weekly dustups will generally be overlooked by track management, all in the interest of selling tickets. Saturday night, however, was a horse of a different color. A little caution-flag rubbing is one thing. Officer-involved shootings are another. Bowman Gray Stadium was hoisted on its own petard Saturday night, nearly paying in blood for decades of lackadaisical enforcement and the tacit approval of conduct that should have little (or nothing) to do with auto racing. 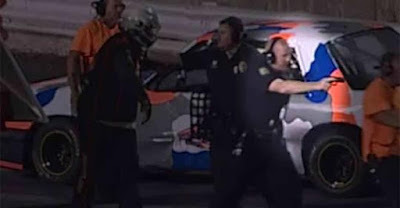 The fact that a racer can engage in conduct severe enough for a police officer to draw his weapon, then only be “escorted back to the pits” says everything that needs to be known about the atmosphere at Bowman Gray Stadium. The inmates are running the asylum, and one of them nearly paid for it with his life. Whether Andy Spears is charged with a criminal offense or not, Bowman Gray Stadium has a responsibility to act. The track, its competitors, its fans and the sport of stock car racing deserve better than to be mischaracterized as some sort of loose-cannon, redneck mob by the actions of an unruly few. What happened Saturday night was a black eye for our sport, and Bowman Gray has some fixing to do. Eight times a bridesmaid, finally a bride. 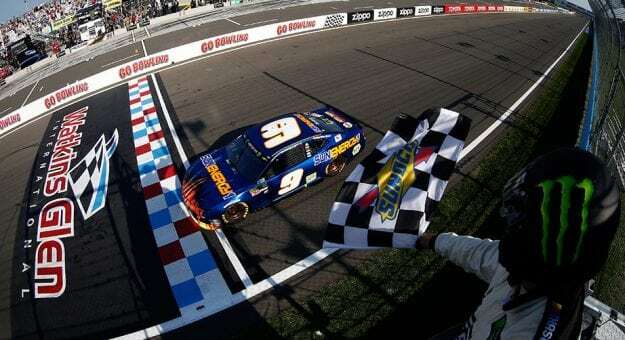 After 99 tries, Chase Elliott is finally a Monster Energy NASCAR Cup Series winner. And for Elliott, his Hendrick Motorsports team, Chevrolet and the sport itself, the victory could not have come at a better time. The 22-year old son of NASCAR Hall of Famer Bill Elliott finally put it all together Sunday, starting third and running up front throughout the day. He won a stage for the third consecutive week – the only Hendrick Motorsports driver to do so this season -- led a whopping 52 laps and took Chevrolet back to Victory Lane for the first time since Austin Dillon’s upset decision in the season-opening Daytona 500. 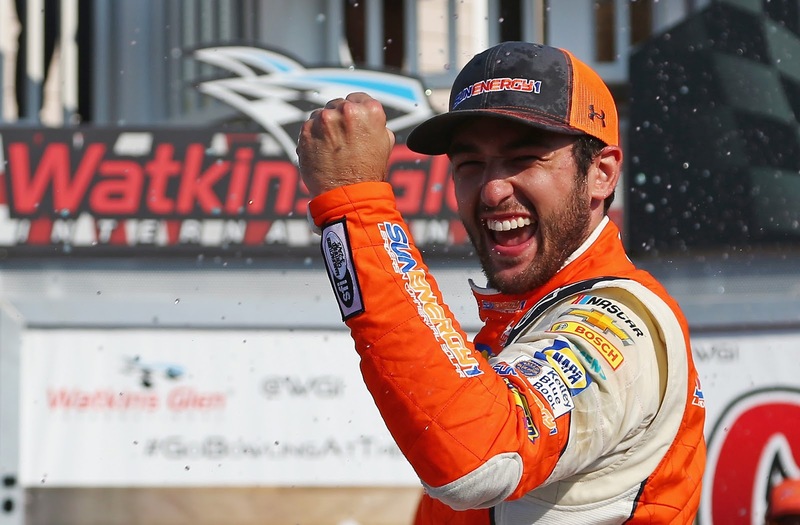 Perhaps more important, he proved that he could withstand the pressure of holding a late-race lead, something he has failed to do a handful of times in the last three seasons en route to a frustrating eight runner-up finishes. Elliott offered a glimpse of what was to come early in Sunday’s race, unexpectedly overpowering leader Kyle Busch on a restart to take the lead. 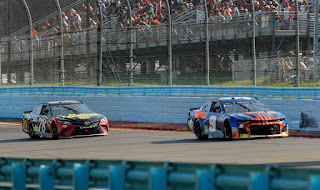 The reaction from the Watkins Glen grandstands was unprecedented since Dale Earnhardt, Jr. retired from the sport at the end of the 2017 campaign, but it was nothing compared to the raucous ovation he received in Victory Lane some two hours later. At least for one day, it proved that NASCAR’s Holy Trinity of Truex, Kevin Harvick and Kyle Busch are beatable, every once in a while. 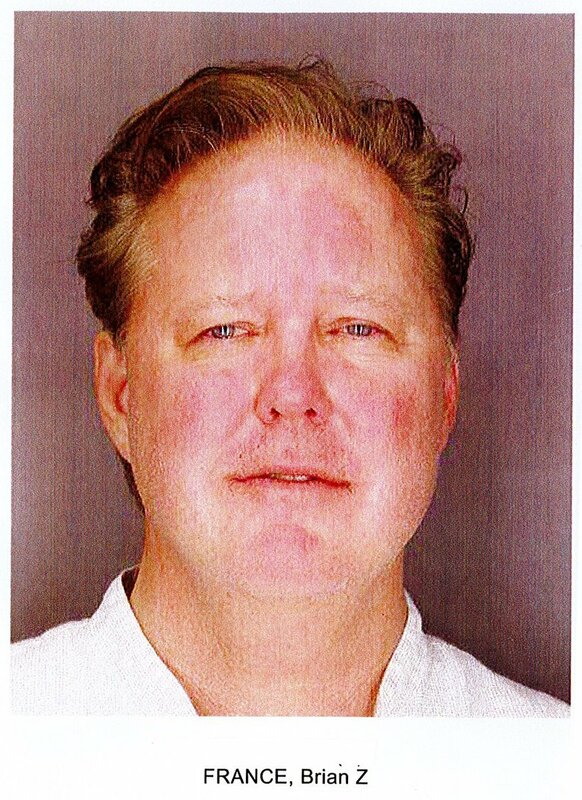 It also provided further proof that NASCAR’s “Young Guns” are more than mere hype and hyperbole. 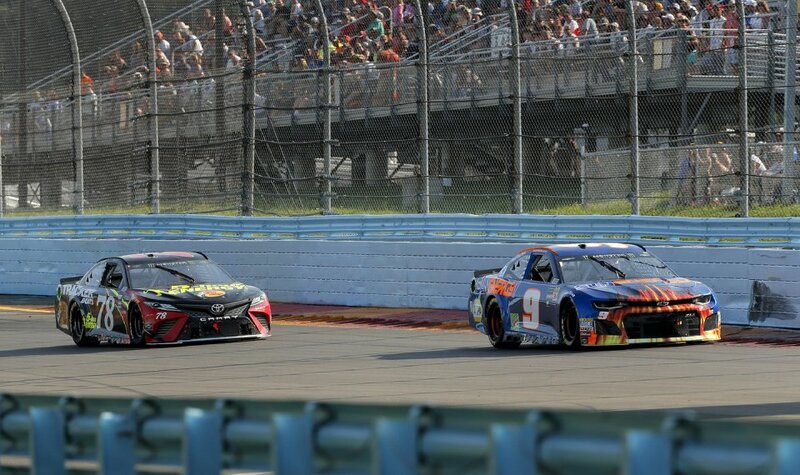 Just weeks after sophomore driver Erik Jones won on the hallowed ground of Daytona, and just a week after Alex Bowman, Daniel Suarez and William Byron all recorded career-best finishes at Pocono, it appears that NASCAR’s Kiddie Corps is beginning to feel its oats. That is good news for the sanctioning body, which generated clouds of promotional hype for its “new stars” at the start of the season, only to have grizzled veterans Harvick, Busch and Truex win three-quarters of the races. Everyone knew Elliott would win eventually. 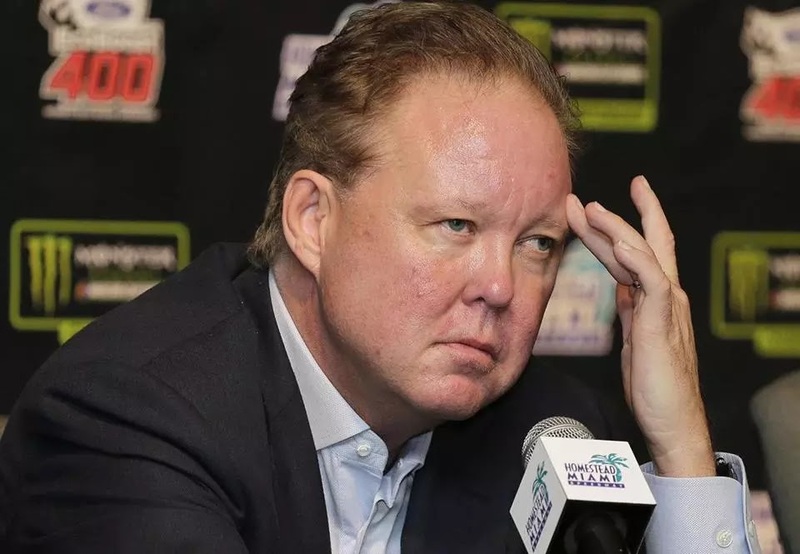 It was a matter of “when,” not “if.” But after inheriting Jeff Gordon’s seat at the pinnacle of Hendrick Motorsports in 2016, expectations were astronomically high. There have been a handful of near-misses in the last three seasons; a blown late restart while leading at Michigan, an infuriating dump-job at the hands of Denny Hamlin at Martinsville, and a late-race loss at Dover last season when Elliott was chased down and passed by Kyle Busch, virtually within sight of the checkered flag. After 99 weeks of frustration and second-guessing, some had begun to wonder if Elliott would ever live up to his lofty expectations. But today, those questions seem a million miles away. "You can win these things a lot of different ways,” said the soft-spoken Elliott Sunday, with his beaming father just a few feet away. “But to actually go out there, run in the top two or three all day long and race the guy that's won the past two road races for a victory at the end is very satisfying. 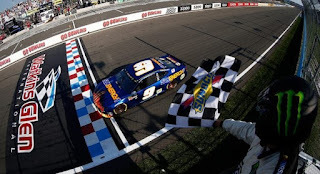 Sound the siren at the Dawsonville Pool Hall, Chase Elliott is finally a MENCS winner.